Please click on the drop down menu above to find the exact SMA Adapter you need. 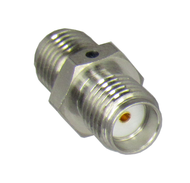 We offer both inner series sma-sma adapters, & also intra series; SMA to Type N, BNC, TNC, 2.92mm, 2.4mm, 3.5mm, 1.85mm, 10-32, etc. 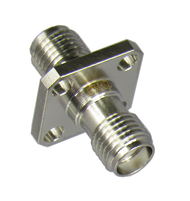 SMA Adapters come in 18gHz (standard) versions and 27gHz versions (precision); also while most of our sma bodies are stainless steel, some are brass which is popular in commercial applications for lower cost. It's important to pick the right torque wrench, which can be a little confusing as standards committee's seem to be gradually lowering torque values. We recommend 8 in-lbs for final installation, 5 in-lbs for test, & 4 in-lbs for brass, but it's always best to look at the manufacturer's specifications. 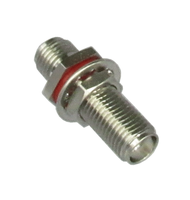 SMA f/f adapters (aka sparkplugs or barrells) are useful for hooking up cables, sma m-f adapters as connector savers, sma m/m adapters for interconnecting eq. Note that while an SMA will mate with 3.5mm and 2,92mm connectors, any bend in the sma pin or if through use its protruding beyond its spec limits by a couple mils, it will damage the 3.5 or 2.92 as they use air dielectrics. We always recommend, and sell, connector savers.